A quadriscriptal text in Chinese and Roman print and braille. In the lower right corner is the character 結 jié, written in braille as ⠅⠬⠂ gyé; compare 西 xī at the center top, rendered in braille as ⠑⠡⠄ syī. 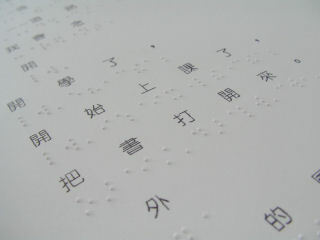 Taiwanese Braille is the braille script used in Taiwan for Taiwanese Mandarin (Guoyu). Although based marginally on international braille, the majority of consonants have been reassigned; also, like Chinese Braille, Taiwanese Braille is a semi-syllabary. The braille letters for zhuyin/pinyin ㄍ g (/k/), ㄘ c (/tsʰ/), and ㄙ s (/s/) double for the alveolo-palatal consonants ㄐ j (/tɕ/), ㄑ q (/tɕʰ/), and ㄒ x (/ɕ/). The latter are followed by close front vowels, namely ㄧ i (/i/) and ㄩ ü (/y/), so the distinction between g, c, s (or z, k, h) and j, q, x in zhuyin and pinyin is redundant. Each medial + rime in zhuyin is written with a single letter in braille. ⠱ is used for both the empty rime -i ([ɨ]), which is not written in zhuyin, and the rime ㄦ er ([ɐɚ]). See for example 斯 sī (⠑⠱⠄) located above the word Daguerre in the image at right. Tone is always marked. This includes toneless syllables such as 了 le, rendered ⠉⠮⠁lė in the image above-right. ↑ Not for Taiwanese Hokkien, which commonly goes by the name "Taiwanese"
↑ Only p m d n g c a e ê ü (from p m d n k j ä è dropped-e ü) approximate the French norm. Other letters have been reassigned so that the sets of letters in groups such as d t n l and g k h are similar in shape. ↑ [sic] One might expect ㄐ j (/tɕ/) to pair with ㄗ z (/ts/), by analogy with the others. Compare here, where the character 學 xué is rendered ⠑⠦⠂ "süé". Historically it could have been either. The principal behind the assignments seems to be that, of the historically appropriate pairs of letters g~z, k~c, and h~s, the letter with the fewer dots is used for j, q, x. This page was last modified on 19 April 2016, at 14:12.